Hi I’m Bron, and I’d like to introduce you to my husband John. We live in Tasmania, an island off the southern end of Australia. We have a “Brady Bunch” family, are parents to 5 gorgeous children and are both health professionals. John’s day job is as a GP (M.D.) and I am a Registered Nurse by profession. John and I have had completely different experiences growing up. Born and bred in Tasmania, John went to the one school for his entire education. His long term plan was to become a medical engineer. He began adult life attending the University of Tasmania. After completion of his first degree he found that he had a passion for medicine and remained working as a Doctor. John enjoyed camping, bush walking, climbing mountains and skiing. He has never lived outside of the state. I was born in Western Australia. By the time I was 10, I had lived in 5 houses and changed schools 4 times. Our family were the proud owners of a caravan. We enjoyed many holidays around Australia. My Dad loved exploring the outback. I have fabulous memories of finding treasures emerald mines and stumbling across indigenous artifacts. When I was 12 we went on our first overseas trip to live in Western Samoa. It was the most magical place for a child. We lived in a village at Piula, a Theological College, where my dad taught. It also happened to have a cave pool that was a tourist attraction. To start with, mum tried to home school us. Let me just say, that not a lot of schoolwork was done. I would spend my days swimming and chatting to people from all over the world. I had the best time. At age 15, we moved to Tasmania where I finished school (I changed schools 12 times in total). After my family moved on, I stayed and went to University. I’ve since been married, had 2 children and think I’ve lived here long enough now to be classed as a Tasmanian! John has a well established surgery in Launceston and has a great reputation in the community. He is thorough and very committed to his profession and is well respected for his work. I enjoyed an unexpected, but wonderful career in the aged care sector which began during my honours year. My work in research resulted in work being published in journals, presenting papers at conferences and teaching at the University. Colleagues coached me in writing funding applications and we subsequently set up programs that aimed to keep older people in their homes for life. Well that was until the youngest member of our family arrived. Our little poppet literally changed our world. She experienced major issues with food. This ended up impacting our lives in ways we would never have dreamed about. Subsequently, I ended up walking away from my career. Since then food has become a major focus in my life. I’ve dabbled in recipe writing, food styling and photography. 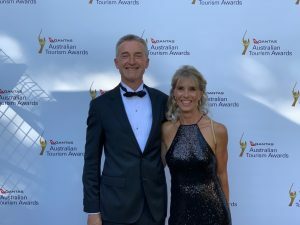 For the past few years, I’ve been on the organising committee for a local food and beverage event called Festivale in 2018 I volunteered to write a tourism award application. We won the State final and that’s how we got to frock up and attend the Australian Tourism Awards (picture above). Two of our favourite things to do are eating and travelling. We have become the ‘go to’ people among friends for questions about travel, food and health. Whilst I long to live overseas I have to admit that Tasmania does offer a great lifestyle. We have amazing countryside, beaches within an hour of where we live. We are lucky to have the Launceston Airport 20 minutes from our doorstep which makes interstate and overseas travel very accessible. Tasmania is blessed with some of the cleanest air and water in the world. We have some amazing fresh produce and a food and beverage industry to boot. These things help our lifestyle choices. While we’ve always been relatively health conscious, our experiences with our youngest child has changed our whole relationship with food . We have researched the heck out of nutrition, attended seminars and experimented on ourselves (and the children). Food is now a major part of who we are. So much so, that it has permeated John’s work with AMAZING results may I say (proud wife right here)! While we’re both fortunate to have reached our 50’s enjoying good health. Yet we still find ways to improve on our commitment to health. Health and travel now appear much higher on our agenda. However, with John’s work commitments we only have very limited time to travel. I continue to enjoy writing about things I love as a food, lifestyle and travel blogger! Through Eat Live Travel we will share recipes, our tips on health and how we manage to travel within a limited time frame. If you would like to know more about how we can help you reach your health goals, would like to work with us or for media enquiries, please contact us below. The benefits of oil pulling, and a “how to” guide.